London and Wall St. are apparently competing for the position of most disliked and least trusted multi-national financial center. Unfortunately, one after another banking scandal is getting almost no airplay in the U.S. at a time when a large portion of the population is struggling just to stay above water. In the latest example of banksters assuming they are above the law and that they never have consequences to their criminal acts, HSBC in London is charged with money laundering. Yes, you heard that correctly – money laundering – for Mexican drug cartels, terrorists, and pariah states no less. This revelation comes on the heels of the big banks in London rigging LIBOR, and JP Morgan in New York of having traders behaving badly to the tune of a potential $6 billion(they originally said it was “only” $2 billion). For now, London is getting the most attention. The U.S.”News”, having been relegated to that of partisan pandering for the Republican Party, offers no objective analysis, and certainly no news for the benefit of the U.S. public. At one time, London had the motto “my word is my bond” and proclaimed itself to live by that when it came to honoring commitments, mostly in financial reporting and the financial markets. Today, that sort motto would get a bankster in the U.S. fired. Even with the 2008 financial crisis and its lingering, festering infection still ravaging the middle class and poor in the U.S., I shudder to think what may come of all the decency and ethics in ANY industry should Mitt Romney win the Presidency or the Democrats lose control of the Senate. Mervyn King (Sir Mervyn Allister King, GBE, FBA is the Governor of the Bank of England and Chairman of the Monetary Policy Committee) and Ben Bernanke have independently described the LIBOR fixing scandal as abject fraud. Unsurprisingly, no arrests have been made and offending banksters are released with full bonuses and clean records. The financial institutions have grown so spectacularly into ginormous monopolistic behemoths since 2008 that the idea of doing what is right and lawful has lost all meaning. What has changed is the spirit of competition: the stakes have changed. Britain’s economy is measured by comparing GDP to the value of transactions in London on an annual basis. Wall Street does not do that. London has been dominated by traders ever since the market was founded on Exchange Alley in the early 18th century. Now, Wall Street is also dominated by traders, but the culture is different: it is less dominated by international banks than is London. International banks inspire less allegiance than domestic ones. HSBC has a colorful background, but its nationality and identity have long been an enigma to outsiders. In that environment, helping clients launder money is not much of a stretch because it sounds like just another service provided to clients in an ultra-competitive globalized financial service industry that has seen ethics literally ignored for decades. In the U.S., this culture of contempt for oversight, transparency, or even honesty began with the Great Manipulator, Ronald Reagan. Most business schools do offer ethics classes. But these classes are normally divided into two kinds. Some simply illustrate ethical dilemmas without taking a firm position on how people or institutions are expected to act in order to BE ethical. For instance, this would be tantamount to presenting students with the pros and cons of racial segregation, but are then left to decide which side they wanted to take or whether one or the other ehtical. Others hide behind the concept of corporate social responsibility, suggesting that social obligations rest on firms, not on individuals. We all know how that has worked out. The emerging LIBOR scandal is another instance, in a long list which is growing daily, of traders behaving badly with no meaningful consequences for their actions. In the LIBOR case, it has apparently been going on for years. I think the primary rationale that enabled this massive fraud is that British and U.S. political opportunists convinced the respective electorates that the if the largest banks in the currency market were asked to report what has become a standard lending rate worldwide, they would not be in cahoots with each other to scam investors. But since that rate is used for everything from commercial lending, to consumer lending, and the swaps market, it was simply too tempting for these ne’er-do-well banksters and politicians to pass up. Those pesky “Job-Killing regulations” that we hear so much about from the GOP are front and center on this issue but no one is communicating that fact to the public…at least in the U.S. And as the general public wanders aimlessly in search of jobs or just to make some sense of what is going on with the U.S. economy, I’m not convinced that even another Depression on the scale of the 1930s would be sufficient to awaken the U.S. electorate that they are being duped. The mere fact that Ronald Reagan can still be held in such inaccurate grace by the GOP is just scarey. Hubris, deception and amorality seem to permeate the financial services industry. The latest example came Tuesday when U.S. lawmakers detailed a pattern of dishonesty and illegal activity at HSBC Holdings PLC, Europe’s biggest bank. For years, the bank looked the other way as terrorists, drug cartels and other criminals used its far-flung operations as a conduit into the U.S. financial system, according to a Senate report. 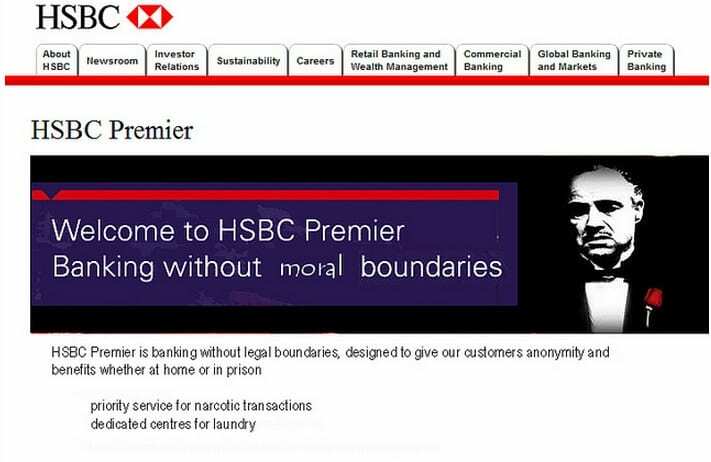 As Leopoldo Barroso, a top HSBC anti-money-laundering official told the bank upon his departure in 2008, the institution’s standard practice was to pursue “profit and targets at all costs” and it was “only a matter of time” before it faced criminal charges…and yet here we are. Investigators in Europe, Asia and the U.S. are piecing together a widespread conspiracy by as many as 16 banks to conceal the extent of their problems during the 2008 financial crisis. They took advantage of the widespread global panic to boost traders’ profits by manipulating the globally important London interbank offered rate, known as LIBOR. The probe has already snared Barclays, which paid about $450 million in fines and civil penalties. JPMorgan Chase & Co. , which had originally reported a $2 billion loss has recently updated the losses of at least $5.8 billion from risky credit-derivatives trades that may have been intentionally mismarked by employees in its London office. Last week, the chairman of Peregrine Financial Group Inc. attempted suicide, leaving a note detailing two decades of embezzlement. The inevitable conclusion is that regulators still believe the old adage, “my word is my bond”, but traders no longer share that sentiment. What is even more astonishing about this abrupt change to anti-ethics is that the Barings collapse in England, should have raised the red flag way back in 1995, but obviously did not. This environment of deceit continued and the result was the 2008 financial crisis in the U.S. Housing market and the collapse of Lehman Brothers. The same is true of JP Morgan. “The Whale”, in this case, was located in London but the bank has seen the results of similar fiascos before. More troubling is the fact that traders know there is no such thing as a “hedge” of that size, but apparently, the bank’s management and U.S. regulators did not know or did not care. Public knowledge of finance is very limited, of course, and some of the banks in the LIBOR scandal are American. But to top it all off, now the Republican presumptive nominee for the November U.S. Presidential refuses to release his income tax returns, despite a growing thunder of calls for Mitt Romney to do so. Even the once steady and reliable U.S. network news organizations are becoming slanted. David Gregory, moderator of NBC’s Meet the Press, and Joe Scarborough, on MSNBC’s Morning Joe no longer even attempt to gloss over their bias in favor of Republicans the way FOX has done from day one. NBCUniversal has obviously made the corporate decision that advertising dollars are worth more than their once-stellar reputation for real news. Romney and his campaign, it’s surrogates and supporters, as GOP operatives, are expected to run campaigns with the prize of winning as their focus. But to do so at any cost, in this case possibly over $1 billion, defies logic. I would have never imagined that the U.S. would have to go through another Depression in order for 99% of the population to realize that they’re being played for fools. This entry was posted on July 23rd 2012 at 12:28pm/12:28 and is filed under Live News Column 1. You can follow any responses to this entry through the RSS 2.0 feed.